Can Popular Weight Loss Aid Treat Other Conditions? In recent years, white bean extract has gained popularity as a natural weight loss aid. Often referred to as Phaseolus vulgaris, the supplement is sourced from white kidney beans and is typically marketed as a "starch blocker" or "starch neutralizer." Proponents claim that white bean extract can fight the effects of alpha-amylase, an enzyme involved in breaking down carbohydrates into sugar. By slowing alpha-amylase activity, white bean extract is thought to prevent the body from turning excess sugar (glucose) into fat. In addition to facilitating weight loss, white bean extract is purported to prevent obesity and directly target and reduce abdominal fat. On top of this, white bean extract is said to fight insulin resistance, increase energy, enhance athletic performance, ease symptoms of arthritis, and reduce the risk of diabetes, heart disease, and colon cancer. Some of these claims are better supported by research than others. To date, there is limited evidence as to the benefit of white bean extract in treating any of the above-listed conditions. Of these, weight loss remains the primary focus of research. White bean extract is actively promoted as a weight loss aid. The conceit is that a substance known as alpha-amylase inhibitor isoform 1 (alpha-AI1) binds to long-chain carbohydrates (a.k.a. starch) and prevents their absorption in the intestine. Phaseolus vulgaris is known to increase the activity of alpha-AI1 and, by doing so, keeps starch from entering the bloodstream and being converted into fat. One of the few clinical trials to evaluate the effectiveness of white bean extract was published in the International Journal of Medical Sciences in 2007. The study involved 60 slightly overweight people whose weight had been stable for at least six months. For 30 days, they were given 445 milligrams (mg) of either white bean extract or a placebo and asked to take it right before a high-carb meal. At the end of the 30-day period, people given the extract experienced a significantly greater reduction in body weight, fat mass, and waistline size compared to the placebo group. What's more, they were better able to maintain their lean body mass after the weight loss was achieved. Other studies have not shown as profound a result. A 2004 study from the University of California Los Angeles (UCLA) reported that, while greater weight loss was achieved in people has been given a 1,500-mg dose of white bean extract before meals, it was not statistically different than those who had been given a placebo. Interestingly, both studies used the same white bean extract (Phase 2 Starch Neutralizer). While the differences in outcomes are hard to explain, further evaluation of the UCLA study showed that people who had more carbs in their meals achieved greater weight loss than those who had less. Though this would seem to endorse the effectiveness of white bean extract, the very notion of increasing carbohydrate to achieve weight loss is contradictory to the aims of any sustained weight loss program. Few would support it. White bean extract may have a place in helping people with diabetes or prediabetes better control their blood sugar. But even that is something of a two-edged sword. A small study conducted in 2009 reported that a 3,000-mg dose of Phaseolus vulgaris powder achieved a 34 percent reduction of the glycemic index (GI) of high glycemic foods like white bread. Lower doses of P. vulgaris powder did not alter the GI. (Strangely enough, neither did a 1,500-, 2,000-, or 3,000-mg P. vulgaris tablet.) Despite the potential benefit, most manufacturers advise against using more than 2,000 mg per day. Most of the other health benefits cited by alternative practitioners are not so much related to the effects of white bean extract but rather the secondary benefits of weight loss in general. As a weight loss aid, white bean extract has never been shown to prevent or treat hypertension, diabetes, arthritis, high cholesterol, cancer, or chronic kidney disease. The same applies to the enhancement of athletic performance or energy. What does affect all of these conditions is obesity, the condition for which white bean extract aims to treat. As such, it is the loss of weight—and not white bean extract specifically—that can potentially treat or prevent diabetes, arthritis, high cholesterol, and all of these other adverse health conditions. 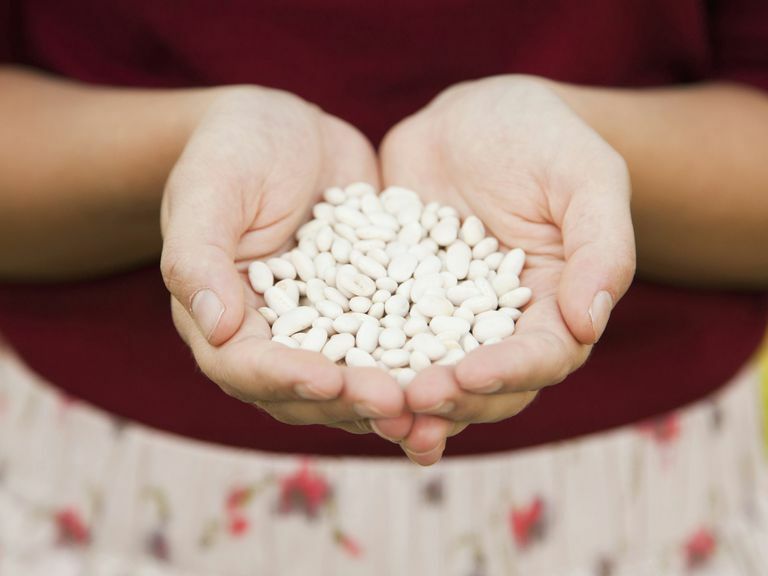 White bean extract is considered safe if taken as prescribed. It is not intended for long-term or ongoing use. White bean extract may trigger minor side effects in some, including nausea, bloating, gas, and diarrhea. People allergic to beans should avoid white bean extracts. White bean extract should not be used in children due to the lack of relevant research. If you're looking to manage your weight or that of your children, the National Institutes of Health suggest following a plan that pairs a balanced diet with regular exercise. If you're still considering using white bean extract, be sure to talk with your healthcare provider first to discuss whether it's appropriate for you. Widely available for purchase online, white bean extract can also be found in many natural-foods stores and stores specializing in dietary supplements. They usually come in tablet or capsule formulations but are also available as powders which you can easily mix into smoothies or juices. It is generally taken in two doses, with one before lunch and the other before dinner. Most manufacturers recommend between 500 and 850 mg per dose, with a maximum daily dose of no more than 2,000 mg.
To ensure a supplement is safe and produced to the highest quality standards, check the product label to see if the brand has been tested and approved by an independent, third-party certifying body like the U.S. Pharmacopeia (USP), NSF International, and ConsumerLab. If you are vegetarian or vegan, don't assume that all white bean extract gel caps are free of animal byproducts. While many will be made with vegetarian cellulose (hydroxypropylmethylcellulose), others may be made with animal-based gelatin. If in doubt, only buy product special labels "vegan" or "vegetarian." As with white bean themselves, white bean extract is known to cause excessive gas in some people. To overcome this, always start with the smallest possible dose so that your body can gradually adapt to the non-digestible carbohydrates in the white bean extract. You can also reduce gas by taking a dose with plenty of green vegetables. On the other hand, avoid eating potatoes, fruit, or sugary foods either two to three hours before or two to three hours after taking a dose. Celleno, L.; Tolaini, M.; D'Amore, A. et al. A Dietary supplement containing standardized Phaseolus vulgaris extract influences body composition of overweight men and women. Int J Med Sci. 2007 Jan 24;4(1):45-52. Udani, J.; Hardy, M.; and Madsen, D. Blocking carbohydrate absorption and weight loss: a clinical trial using Phase 2 brand proprietary fractionated white bean extract. Altern Med Rev. 2004 Mar;9(1):63-9. Udani, J.; Singh, B.; and Barrett, M. Lowering the glycemic index of white bread using a white bean extract. Nutr J. 2009 8:52. DOI: 10.1186/1475-2891-8-52.